So, You’re Raising Your Grandkids! It is common to see grandparents raise their grandkids. The reasons vary from the children getting in trouble, passing away, divorce, teen pregnancies, parents being in jail, not being in a capacity to raise the kids, or not having the right parental skills. Grandparents raising grandkids may seem easy, but it’s not. Harriet Hodgson takes us through the struggles, the fun times that create the relationship children have with their grandparents. Harriet Hodgson uses real-life example to delivery some poignant and sage advice. She raised her daughters’ children, and so speaks from a position of experience throughout the book, but not as a teacher, more as a knowing grandparent. The kids were twins and raising them was an amazing experience. 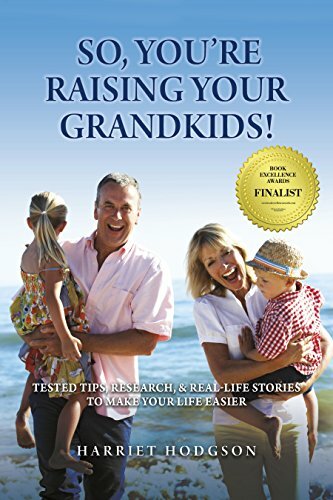 The author notes how difficult it can be when grandkids ask for information which you think would be best explained by their parents. Losing her daughter was painful. Grieving for her daughter, the twin’s father, her brother, and father in law was among the lowest moments in her life. This book reads like a parenting guide for grandparents. Some may feel that, since they are grandparents, they know how to raise kids. But remember, you are raising kids from a different perspective now and this book illuminates those differences and helps you tackle them. The author writes about family values and helps one understand what children want and how they should be treated. Raising teens can be an uphill task for anyone. The writer shares her experience raising her grandkids in their teen years, and how adolescents react to issues. The tips Harriet Hodgson shares should be mastered by everyone as they will always come in handy at some point in life. The book is written in a flowing style, with the author listing her thoughts then explaining later in detail. This book not only educates you on parenting, but also helps to understand and cope with grief. Throughout the bok Harriet Hodgson words are backed by research and science. That is the other amazing thing about this book. Everything listed is a fact, and one gets to understand how some families come to be. From the texts in the book, one can tell that Harriet is excellent at care-giving. I’ve learned a lot just by reading this book. Mourning can take a toll on someone, but there is always that period where you rise up. The author did well by talking about stress and the effect it has on kids and how one should take care of their health. You understand how you can encourage a child to aim higher and get to the peak in everything they do.